Welcome to Seattle Bliss. Your Membership supports all production of content here at Seattle Bliss, but also provides FREE MMJ consulting services for those who cannot afford them. Because Seattle Bliss (TM) isn't a non-profit, Seattle Bliss (TM) Membership is billed as a subscription. Free Membership is absolutely free! Simply subscribe to the Seattle Bliss (TM) news feed and you will receive notices about new articles and offers in your email. Read every article, watch every video and learn all you want from what is published here. No charge. Business Membership is limited to $50 per month. Business Members with State-licensed, legal, Cannabis-related businesses may be visited by a Seattle Bliss (TM) Tour (promotional opportunity). In-kind donation of data is unlimited. We'll accept as many lab-certified terpene assays as you can send. * Seattle Bliss (TM) Subscriber Services include peer-to-peer consultation via comments, social media, message board or other public activity; Private consultation is not available at this time; all emails requesting consultation MAY/COULD HAVE PORTIONS SHARED PUBLICLY (with identities concealed) in any Seattle Bliss (TM) publication. ** Seattle Bliss (TM) Tours are free for Contributing Members. Each fully paid Contributing Membership may receive one (1) free Seattle Bliss (TM) Tour per year. Free Tour status continues with renewal, including monthly, after the initial year's membership is paid in full. Want a FREE Seattle Bliss (TM) Tour today? Pay your first year's Contributor Membership (below), and call no less than 4 hours before/ahead of your tour. *** Seattle Bliss (TM) Tours may visit any Business Member's cannabis-related business. Video and articles may be produced about the tour and other issues, thereby giving the Business Member a great deal of exposure, not only to the tour group, but also to readers and viewers. Business Members' products, though fully visible, are not intended to be advertised, but shown in full disclosure as opinions of Seattle Bliss (TM) personnel and guests are their own. Extremely strong and durable herb grinders are laser engraved to never fade, and come with a lifetime warranty. 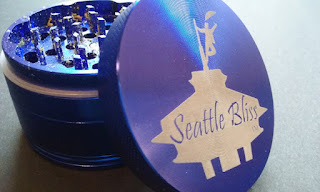 The Seattle Bliss (TM) 4-piece grinder comes in Seattle Bliss (TM) blue, and is a large 62 mm (2.5 in) with a very nice kief collection chamber.